Rev. Dr. Brian Bailey (1925-2012) was a minister of the gospel for over 60 years. He was the founder and president of Zion Fellowship and Zion Christian University, chancellor of Zion Ministerial Institute, and senior pastor of Zion Chapel. In his ministry, he authored 65 books (which have been translated into as many as 34 languages), and traveled extensively to over 100 countries, teaching and preaching. At the age of 87, he was still teaching, preaching, and counseling (even during his final illness, as strength allowed) until the Lord took him home on June 11, 2012. 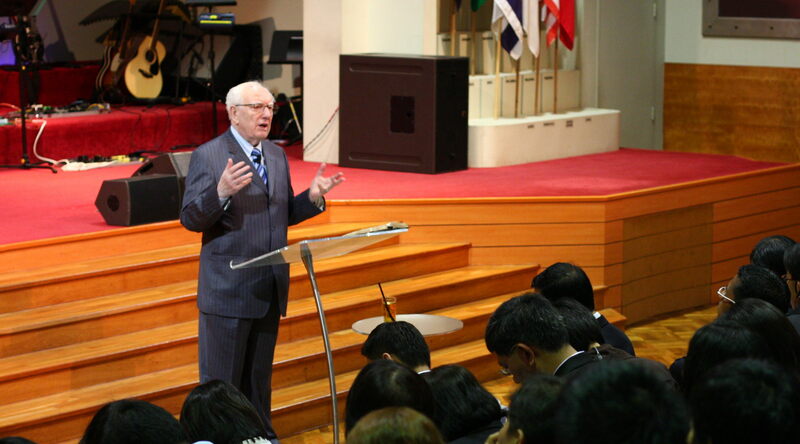 Pastor Bailey was born on April 6, 1925, in London, England. After living through the London Blitz during World War II, and later training with the RAF Auxiliary, he took a job in the area of research science, where a colleague witnessed to him about the Second Coming of Christ. That day he accepted the Lord and began a spiritual journey that led him to a worldwide ministry. His spiritual training began when he attended three different Bible schools in England prior to going to France as a missionary. In the mid-1950s he was vice president and teacher in a Christian Hotel and Conference Center in Chateau D’Oeux, Switzerland. In 1958 that he met Audrey Lawler, who had traveled from Seattle, Washington to visit Switzerland. They were soon married; and in the 1960s they traveled to the United States, where they pastored an evangelical church in the state of Washington. During this period, Pastor Bailey had an experience of dying and going to Heaven, where he was told by the Lord that he had not fulfilled his course and should return to earth. The Lord gave him this experience so that he could share throughout the world what it is like when people die and stand before the judgment seat of Christ not having fulfilled the will of God for their lives. For a brief time the Baileys pastored a church in Clearwater, Florida, the city which is now home to Zion Christian University. In 1965 they were invited to be on the teaching staff at Elim Bible Institute, Lima, NY. Several of the young students they taught at Elim later became leaders and pastors in Zion Fellowship. In 1969 they moved to New Zealand where they taught at Faith Bible College in Tauranga. Pastor Bailey was used mightily in a church in Auckland where God poured out His Spirit in revival. This revival brought a great drawing in the hearts of people to learn about the ways of God, resulting in missionaries being sent to many nations. In the early 1970s, Pastor & Sister Bailey were involved with World MAP (Missionary Assistance Plan), founded by Ralph Mahoney. During this time they traveled around the world teaching in pastors’ seminars. In the early 1980’s, Pastor Bailey became President of an organization called Hebron Missionary Fellowship. God gave a vision to Pastor Bailey that the name would be changed to Zion Fellowship in 1991; and this name became official on February 27, 1992. Beginning in 1994, Pastor Bailey began writing his books during the time of his wife’s illness of four years. By the time he went to be with the Lord in 2012, he had written 65 books, many of which are used in the curriculum of Zion Christian University. His leadership and ministry have produced many teachers and missionaries who conduct seminars and teach in Bible Institutes around the world. Missions works and Bible schools have been planted in a multitude of nations throughout the earth, and are continuing to expand. The Lord spoke to Pastor Bailey that Zion Fellowship will have a Bible school in every nation. Thus, the vision that God entrusted to Pastor Bailey is still being fulfilled, and we trust, will only become more significant and fully realized in the days to come.